Oh! Oh! the Marmalade Cat! Business Class ... all 35 hours of it! And where did this unusual event take place? At the Berlin Staatsoper. And the occasion? Their new production of the Basel Theatre’s Der fliegende Holländer. The root of the production’s success lies in its design (Philipp Stölzl, Conrad Moritz Reinhardt), which is neatly aligned with the now almost usual idea of approaching the show through its heroine, and her neuroses, rather than through the titular Dutchman. 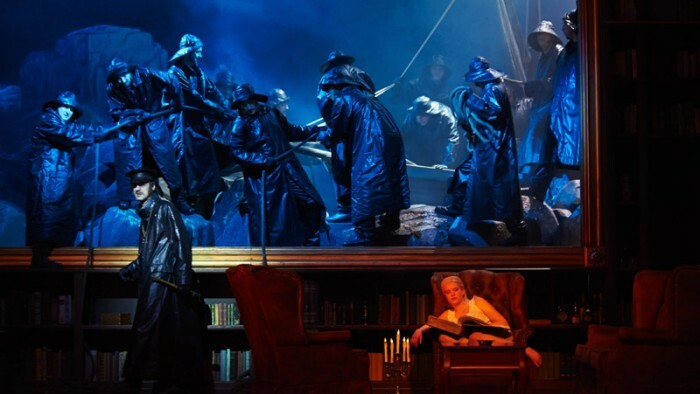 The stage pictures which form the centrepiece of the action are gloriously done – nineteenth century paintings realised in a sort of 3-D -- glowing with light and humming with activity. This is the Dutchman’s ‘world’, this picture on the wall of the prosaic Daland’s library (100s of books and dozens of maids) where the plain spinsterish Senta sits and dreams her life away, as if in a parallel world. 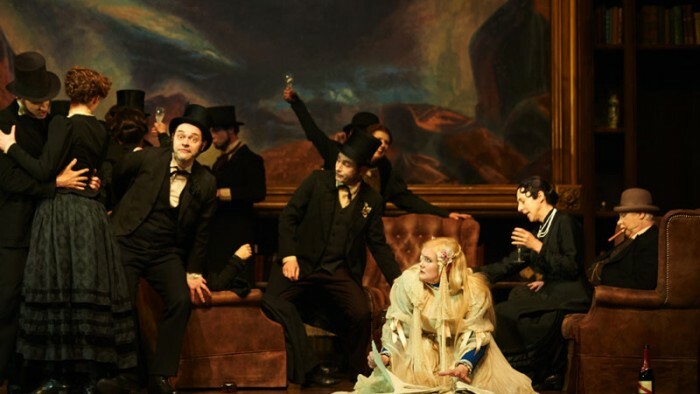 The concept was splendidly worked out, designed and staged (Stölzl, Mara Kurotschka), in spite of the problems that the novice librettist, Mr Wagner, sets anyone staging this opera (eg the embarrassing wedding feast choruses), problems which unfortunately can’t be avoided. Still, tonight the chorus – particularly the girls – sang much better than they did in Freischütz. Now they have to learn to stand still, and not ‘act’. 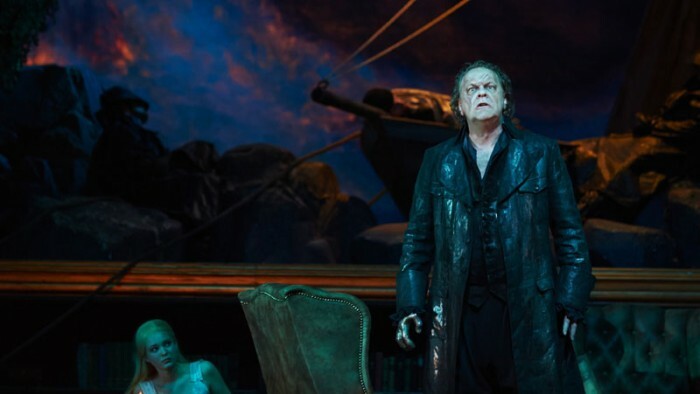 The on-stage star of the evening was, rightfully, the Dutchman (Michael Volle). He seems born for this part, singing it and acting it with a rich and powerful bass-baritone, and showing all the magnetism which sends the unstable and imaginative Senta round the bend. Senta (Emma Vetter) took a while to gather steam, but was going strong by the last act. There was a particularly fine Erik from Stephen Rügamer, ringing and passionate, and a competent Daland – what else can you do with this non-part except be ‘competent’ – from Tobias Schabel. The Steersman (Peter Sonn) has a nice voice, but also a wobble. Just one casting query. When so much trouble has been taken over the visuals of the show, why cast Daland with a man who looks like Erik’s contemporary, and Senta’s son. I know it shouldn’t matter, but it spoils the story’s credibility. And one design query. Please can we throw out those awful Gretchen wigs – the peroxide blonde, stringy ones – which invade German opera. Senta’s, especially over the gaping back of her wedding dress, made her look like a comical kewpie doll. But the queries and quibbles were few to non-existent tonight. When I scurried for my train, after the third curtain call people were still clapping furiously. Wouldn’t it be nice if that happened all the time. Tonight I went to the Deutsche Oper to see, or rather to hear, Donizetti’s Lucrezia Borgia, performed in concert. The bulging, excited audience, however, had – it seemed clear -- mostly come for something slightly different: to hear and ravenously applaud prima donna Edita Gruberova – billed, figuratively, huge above the title as the lady with the poisoned chalice. Madame Gruberova is exactly my age. Sixty-seven. Now, I have no truck with ageing artists and ex-stars who keep on performing when they can no longer cut the mustard. But Edita Gruberova is not one of these. Admittedly, her vocals were occasionally just a little imperfect (whose aren’t? ), especially at the start, but she warmed up into an absolutely unforgettable prima donna – managing, husbanding and sharing her voice with admirable skill -- and her final dramatic scene with Gennaro was breathtaking. It is not the performance of a 30 year old – rash, raw and risky. Every aspect of Gruberova’s Lucrezia was minutely studied and played with utmost care. The music, of course, but also every move, every expression, every bit of delicious mezza voce, right down to details such as the perfect burgundy gown and Carol Channing hair. For she acted the role, concert or no, as convincingly as she sang it. Who would believe that one’s heart could go out to the deadly Borgia in her final bravura. But mine did. This morning, I was asked to define the term ‘diva’ in an interview. 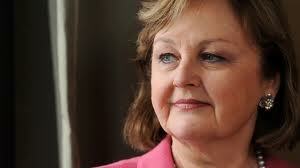 This lady is a diva, in the best sense of the word. An utterly professional, opera-sized vocalist and actress who can bring an audience to its feet, cheering, with her charisma and talent. The evening, however, was not all about the star. Far from it. Lucrezia Borgia has three other large roles which have to be equally well filled: and tonight, they were. I have complained these recent weeks about Berlin’s feeble tenors. Tonight, I was liberated. Gennaro is a long and rather wimpy part, with his best opportunities in duet, but Pavol Breslik made him into a virile fellow with a ringing, clear tenor voice, a perfect foil for his ‘mother’, and the audience -- and I – just loved him. Equally – maybe even more – I loved the bass playing Alfonso. In the cruel way of composers, he comes on and goes straight into his showy Vendetta aria. He was not deterred. It was a triumph: a grand, smooth, seamless voice with the bottom notes pinging through and the top ones pinging out, effortlessly, in a grand aria. The audience exploded. Mr Alex Esposito goes on to my ‘must see again’ list. And, I imagine, everyone else’s. Maffeo Orsini was Jana Kurucova (who I noticed as Ines in last year’s Trovatore). She, too, has to start with a big sing and got rather swallowed up therein by the lush orchestra, which just occasionally forgot it wasn’t in the pit and gave the low voices, in particular, a hard time. Kurucova gave us all the Alboni frills, in a lively, accurate and likeable singing and acting performance, but I did miss the ‘Alboni’ plumbing low notes, especially in ‘Il Segreto’. Every single one of the indistinguishable supporting men was more than adequate, as was the male chorus, up in the choir stalls and not wriggling about too much. The ladies’ chorus could have stayed home: they have nothing to do. 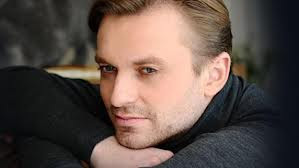 Andriy Yurkevych at the baton seemed to have a good relationship with his singers – a kind of important thing in opera – and my only complaint about the orchestra was, as I have said, the occasional over-generosity with volume behind the singers. 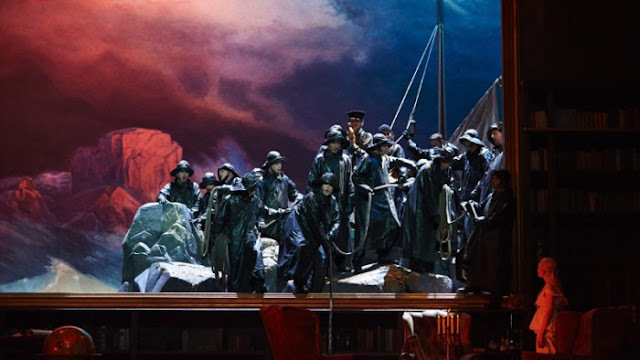 Last year, I opined that Il Trovatore lost much of its drama, transferred to the concert stage. Lucrezia Borgia, essentially an intimate tale, lost absolutely none. In fact, it probably gained from the focus achieved. But I will repeat my last year’s wail of horror on one point: get rid of the wretched music stands and pretend scores for the small part players. They don’t need them, and the page turning and going on and off resembles nothing better than a provincial oratorio. Then, a concert version of this – and many other -- operas, I am sure, will be on the way to being preferable to a fully staged version, full of distracting ‘concept’ and banalities. But for tonight: all I can say is ‘thank you’. You -- all of you -- made my first ever Lucrezia Borgia a real treat. DER DEUTSCHER DIRIGENTENPREIS, or Shut up and play! Another full-blown week ... starting with a couple of repeats: a new visit to the hilarious The Dance of the Vampires and our fifth (already!) evening out tasting the delights at the Katz Orange. Followed by a home concert: I am being initiated into the joys of Schumann, Mendelssohn and Brahms. The theatre visit was a special one, for we went in the company of author Michael Kunze and his wife, Roswitha, whom I last breakfasted with in Vienna … fourteen years ago, after flying up from Nice to see Michael’s musical Mozart. The show, of course, I’ve raved about before, but the new cast was very fine, and their diction was impeccable. Even I could understand. And that in spite of (or because of) the fact that the Russian and Hungarian leading players … don’t speak German! And then on to last night. A delicious dinner of Nüremberg sausages and sauerkraut (Paul had spinach dumplings, mmm) at the must-do Augustiner Café, and then across the road, under threatening skies, to the beautiful Konzerthaus. We’d chosen for our first visit this season a nice little programme of Janacek, Mahler and Debussy, being played under the umbrella of a Deutsche Dirigentenpreis: three young conductors competing for 35,000 euros. I always like competitions: both Paul and I were serial winners of such events in days of yore, although in my time the cash prizes were er …slightly less! And I’ve been a judge, in one form or another, quite a bit. Not, however, of conductors. That’s his field of expertise. So, let’s see..
Well, we encountered a problem. A competition does not always stand up as a concert, and this one didn’t. For one very good reason. We had around an hour and a quarter of enjoyable music … and more than twenty minutes, yes, read my lips, twenty minutes of balding men in suits, evidently unaccustomed to public speaking, wittering on, telling you what was already in the programme and … I imagine (for my German isn’t up to it) they were organiser and sponsor being ‘moment-of-glory’ish. Well, they ruined their own show. Any atmosphere of music created by the Janacek was utterly dissipated, any feeling of a concert was dissipated. It was just a contest run by men in suits. And you could doze off, through the yatter, until the music started again. Number 2, who had to pick up the show and wake the sleepers after the chat marathon chose Mahler’s ‘Totenfeier’. I had said to Paul beforehand, I’m going to be no good as a ‘judge’ here, I’ll just choose the loveliest piece of music. Well, this was it. The young man was a lot more modest, less flailing, and was evidently involved with this seriously emotional music. OK, even I could hear that occasionally there was a little slip: but here’s the contest problem. Do you choose something ambitious and have a wee accident, or do you choose something safe and do it perfectly. Both of us have always been type (a) – I once sang the whole Death of Boris Godunov in a teenage competition (and won!) – so I enjoyed this. Number three was different again. You couldn’t accuse Debussy’s ‘La Mer’ of being easy or emotionless. The young lady conducted it very competently indeed, give or take too many imitations of a seagull, giving a wholly finished performance. So what were the judges going to go for? The technique of No 1, the ambitious emotion and obvious promise of no 2, or the finished performance of No 3. No prizes for guessing which way I would have gone. The other question was, were we going to stay to find out? Others weren’t. If the suits started talking again, we too would go home and look up the result later. Well, they didn’t. The President of the Jury briskly and pleasingly said a few words and then announced the winner. Janacek 1st, Debussy 2nd, Mahler 3rd. The winner – Ms Kristiina Poska of Estonia and the Komische Oper – took up the baton and gave us a rousing version of a well-known Brahms Hungarian Dance, with no ballons de bras, which was a perfect ending to the night. We all went out humming it. So we stayed far too long (when the food service stops, you can smoke inside, so I have a sore throat this morning) and tiptoed the few yards home in the rain after a grand evening which even the men in suits hadn’t managed totally to spoil. Note 1: Can we have a total ban in German concerts on anybody in a suit – or just plain anyone! – talking from the platform. You have a programme for information. It is pure ego trip. Note 2: why did the two lady dirigents appear in a mock up of male attire? Black is fine -- it helps the conductor disappear – but why not a dress? Note 3: to the Konzerthaus management. I love your hall, but I must protest about the treatment of Mendelssohn. I had Wagner staring over my shoulder all night and poor Felix is shut in the closet!